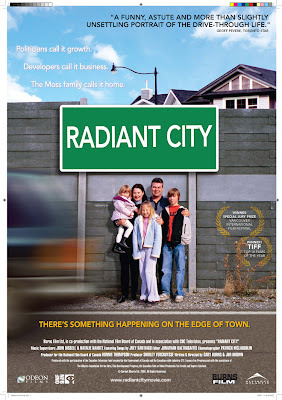 Radiant City (2006) is a film about suburbia, urban sprawl, and the mindset of those who call 'the burbs' home (aka the bulk of the North American population). It's meant to be a slice of life, but there's something else going on here. What I liked about Radiant City was how it brought my attention to the realistic concern of how long we can continue to grow like this - or view growth as simply a matter of construction. The conservationist movement is becoming more prevalent each year, and yet we continue to build cookie-cutter neighbourhoods farther and farther away from actual services. Our society is so dependent on owning a vehicle now that navigating our cities has become less about interaction and more about forming lines. I was intrigued by the argument that our new idea of community is conflicted with our desire for privacy. Fenced sub-divisions, private transportation, individual cubicles; these cliches of post-modern living have been the subject of debate for decades, but there's a hint of something here that should've been explored in greater detail. Radiant City, unfortunately, isn't saying enough. Instead of really diving into the stories behind potential alternatives, or possibilities for refurbishment and smart growth, the film dwindles in its final chapter relying on a gimmick to try and prove a separate point. I can understand the logic behind why the filmmakers decided to go this way, but I can't help but feel it only serves to undermine the points that the rest of the film is based on. It's like they didn't have faith that people really cared about the truth behind something most of us could relate to? The facts become lost in a foggy epilogue that derails the argument for the sake of forced poeticism. Yes the suburbs are big, yes they're wasteful, and yes there are interesting stories as to why we live this way. I wish this documentary was more like the trailer I watched after seeing the film though instead of simply stereotyping the suburban experience as the pursuit of a fantasy - there's more to it than that. People also just need places to live. 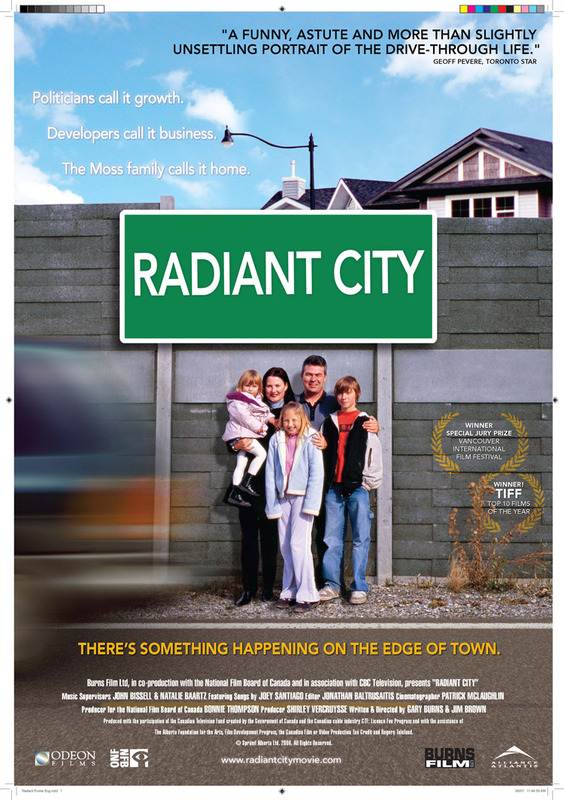 While I wouldn't recommend Radiant City based on its merit as an informative documentary, it would still make a great film school lesson in that it offers a lot of material for debate on the choices the filmmakers made in constructing their argument - see the IMDB forum for spoilers on why this is. Funny, I almost did a GWLC to this. I had no clue really going into it. Promising Canadian filmmaker and commentary on Suburbs not much else. Which I kinda agree with and it makes you consider how you live, made me miss small town Saskatchewan. I'd have peged it a little highter as somehting people should watch for those values. I agree with youu that without the gimmicky end the comentary on this way of life would have been much more powerful. Which actually brings me to a question, can/should I play the spoiler and reveal the truth about this documentary that the end apparently makes so clear? Hope you know what I'm talking about. work won't let me sign in. No, I wouldn't spoil the ending. It's easy to figure out if you visit the IMDB forum for this movie anyway. It's interesting how much that conclusion shapes what the message of the documentary is though. It seems like a weird and obvious point to make after all the build up. I would still love to hear more on urban sprawl or why we live the way we do, etc. There's so much info to explore here I just wish they wouldn't have cheaped out. Cool to see that most of the film was focused around Calgary though - I know that place all too well. I was moreso talking about the fact that the end makes your heading seem flawed. I think people could be duped into thinking this is a real documentary rather than a cross of research and fiction. That end scene throws it in you face that it's all fake. I will take your comment addition or deletion as your answer on whether this is a spoiler. Well it is still a documentary though - that's the conflict. The point of the film is to still make a comment on suburban life, and this is mixed with actual talking heads from experts (that are real). The slip up is that the last 15min make you question the legitimacy of what you've watched, but that's not to say they weren't trying to inform. As part of my '9 docs project' where I'll be writing about 8 more documentaries, I'll cover a lot more random styles and approaches with the films I picked up. Radiant City isn't a narrative or even a mockumentary, it's documenting - the twist is simply thrown in to reveal another truth. I just think they failed at this. I agree completely, just I wouldn't call it a documentary by any means. To me it is more fiction based on some fact like any historical representation (something like Pearl Harbour or 300) or a story like the Di Vinci Code or dare I say Blair Witch. I'd relate it closer to the DC just a modern adaptation. This is actually exactly what my article was going to be about, how would I categorize this? it came to me when I thought of Documenting as recording the events, where this doesn't record or re-pict true events or as close to true events. 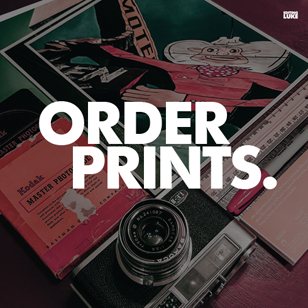 Instead they create their own story. This is my same issue with Mike Moore. The difference is the staged events in this case drive the movie. Its a thin line and I had more reasons that this was not a documentary and my written work became more con than pro so I garbaged the thing. I even went back to some old text books. Anyways thin line, I think people should watch it for themselves and let them decide. I think you should have a poll on your blog in the side bar. You'll find this movie at your library kids. thanks very much about this article. i so like this film, can u give me link download for this film..